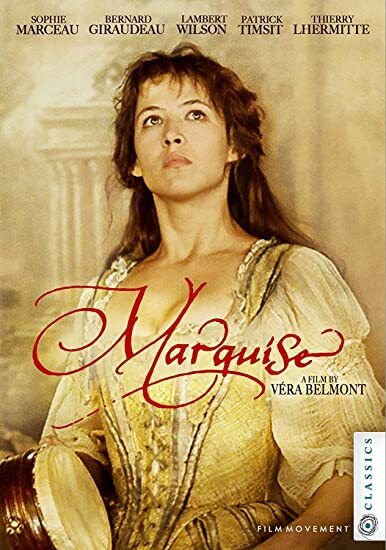 Born into poverty, Marquise (Sophie Marceau) is a promiscuous young woman who uses her exquisite beauty and seductive dancing to earn a living. When the distinguished Molière (Bernard Giraudeau) and his theatre troupe come to town, Marquise mesmerises the men, especially the lead actor, nicknamed Gros René, (Patrick Timsit), who falls in love with her and asks for her hand in marriage. She agrees on condition that she joins the group to become an actress. Gros René is deeply in love with his wife, and even accepts her on-going infidelities, until she meets Jean Racine (Lambert Wilson), while they are performing for King Louis XIV and his court. Although flirtatious in manner, Marquise carries honour and integrity in her heart. Following Racine's coaching, Marquise's acting talents improve dramatically, and she is at last able to perform the leading dramatic role in his play Andromaque. Bonus features include interview with director Véra Belmont and essay by Laurence Marie-Sacks.